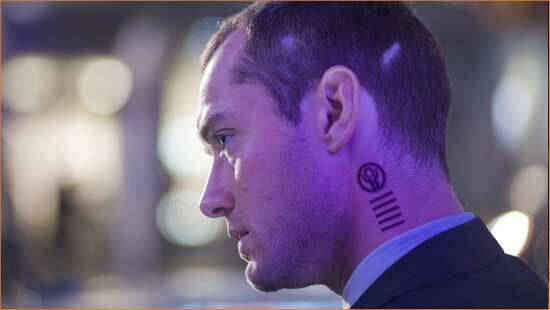 Jude Law can't save the derivative wannabe "Repo Men". It’s been almost 24 years since Geraldo Rivera had a good chunk of America glued to their TV sets waiting breathlessly as he unearthed the secrets and treasures hidden in the vault of one Alphonse Capone. In the end, all our intrepid reporter found was only the passage of time and the start of the long, unfinished journey back to credibility. Some things just don’t live up to the hype. Such is the case with “Repo Men”. For many months leading up to its release, there’s been a moderate debate on whether or not the story was stolen from 2008’s “REPO! The Genetic Opera”. I think the more important question should have been is it a good enough of a movie for people to care in the first place. “Repo Men”, directed by Miguel Sapochnik and written by Eric Garcia and Garrett Lerner, is the tale of Remy (Jude Law), a blue collarish family man whose job just happens to be repossessing organs from people who have fallen behind on their payments. Naturally, these organs aren’t kept in neat, clean sterile jars, but within their unfortunate owners requiring impromptu surgical removal. It’s messy and unpleasant but a job is a job. His wife feels otherwise and asks that he moves from repo to sales to spend more time with his family. His long-time friend and partner in repossession, Jake (Forrest Whitaker), tries to convince him otherwise. It’s not until an on-the-job accident that makes him the recipient of one of his company’s products (predictably – a new heart), and the accompanying payments, does Remy truly ponder the impact of his life choices. What follows is an uninteresting and overlong trek down familiar Sci-Fi paths that we’ve been down before with better results. It’s been said before that great directors pay homage and lesser directors steal, Sapochnik and Company’s work here is downright larcenous. There’s a bit of “Bladerunner” here, some “Robocop” there, a pinch of “Pulp Fiction” and a dash of “Boondock Saints”. Sadly, like most derivatives it’s not as good as the original but it is bothersome. There were a few times during the movie where I thought to myself, “I’ve seen that shot before. I enjoyed it more the first time.” I got the impression that they were trying too hard to be likeable and ended up only being bland. As for it’s much-ballyhooed similarities with “REPO!”, yes there are similarities – quite a few really – but it differs from it’s operatic cousin in one very important way. “REPO!” is one of those movies people either love or hate. There are very few who occupy any middle ground where it’s concerned. “Repo Men” is a movie that garners indifference: it is the Cheez-Wiz of Sci-Fi. Sadly mired in its mediocrity are wonderful performances by Law and Whitaker, who share a wonderful chemistry together as friends who’ve traveled through life together and now work together repossessing organs. Individually, Law brings a nice working man’s weariness to the part that really makes his role work. And yes, ladies, strips down to a tank top in one scene, but I think he’s a little too wiry to be taken seriously as the action hero type. Whitaker, simply, is Whitaker, bringing his A-game to a part that could have easily fallen into cliché, instead giving Jake not just an edge but a soul. Liev Schreiber is bang on as Jake and Remy’s manager and could easily be the patron saint of used car salesmen, literally asking people, “What’ll it take to get you into some new lungs today?” Alice Braga is also good as Remy’s love interest, Beth but in places seems like nothing more than a plot device. “Repo Men” no doubt will probably have a nice opening weekend, but I found it really didn’t stir much in me one way or the other. It is just one of those movies that, unfortunately, is less than the sum of its parts. I was looking forward to seeing this one, but I really value your opinion and will wait for the DVD.